Marchez partout à Tahoe City! Jacuzzi! Juste un saut, sauter, et un saut de restaurants de Tahoe City, boutiques et communes Plage du lac Tahoe, est notre 4bd, maison de montagne 2ba. Construit en 2006, notre maison de montagne se sent tout nouveau, mais conserve ce charme ancien Tahoe avec la montagne style rustique. Le bain à remous est BRAND NEW 2014. Il y a aussi un ascenseur qui fonctionne (veuillez nous informer si vous devez utiliser l'ascenseur, il est désactivé sauf si nécessaire) et une salle de bains accessible aux fauteuils roulants. Vélos! Paddle boards! Vous êtes si près de Tahoe City, vous pouvez marcher à Rosie pour le petit déjeuner dans une tempête white-out hiver ou la tête du club de golf pour le ski de fond, raquettes et luge (parfait pour les enfants)! En été, vous pouvez marcher à des concerts hebdomadaires à la plage, le marché des agriculteurs, le rafting de la rivière Truckee, terrains de jeux, golf, littéralement tout est juste un jet de pierre de là. La grande salle de notre maison est parfaite pour sortir avec l'ensemble du groupe. La cuisine ouvre sur la salle à manger et salon pour le lieu de manuel pour tout l'équipage à traîner, si la cuisine, salle à manger, ou la réfrigération en face du jeu Niners ou Giants, vous êtes tous là. La nouvelle table de salle à manger est assez grande pour 8 adultes avec des sièges pour 3 plus au bar. Nos 4 grandes chambres sont flexibles pour accueillir de nombreux groupes différents. La chambre Moose a un lit king size avec de hauts plafonds et des vues, l'ours et la truite chambres ont chacune marque de nouveaux lits queen, et charme rustique, tandis que la chambre avec lits superposés de Lapin dispose de 2 ensembles de lits superposés avec la marque de matelas nouvelles et des draps pour les gamins. Il ya une télévision et le câble dans la chambre avec lits superposés de sorte que les enfants peuvent regarder un film et se reposer après une journée à la montagne, tandis que les adultes bénéficient d'un grand dîner. "Sérieusement, vous pouvez marcher à Jakes dans un blizzard confortablement". "Combien d'étapes pensez-vous qu'il est de Rosie? 150 peut-être? ". "Je ne peux pas attendre pour rouler en vélo de Beach Cruiser communes et aller à la piscine." "Laisse aller en raquettes ou en ski de fond à travers le parcours de golf!" "Je suppose que je ne pouvais tout simplement apporter un panier de traction et marcher jusqu'à la maison de golf du club"
"Wow, nous pouvons monter croiseurs de radeau de la rivière Truckee!" Je suis loue les lieux à Tahoe toute ma vie. Je suis toujours un grand fan de lieux qui avaient jouets pour moi de jouer avec. Donc, je l'ai commencé à combler notre garage avec des jouets à partager avec ma famille, mes amis, et les locataires. Je dois 2 paires de chaussures de neige, hommes et femmes. Aller Stomp à travers le parcours de golf. Nous avons 5 traîneaux pour glisser vers le bas de la montagne. Cet été, nous allons ajouter vélos cruiser et se tenir debout planches à pagayer. Nous avons ajouté le pont inférieur et un bain à remous, bains à remous hiver mérite! Nous avons également commencé à mettre sur pied un livre de table à café pour vous guider à travers tous les bons moments pour être eu, restaurants, plages secrètes, et de trésors cachés. Nous avons passé les deux derniers mois pour qu'il soit prêt pour vous, venez en profiter! This house is awesome! Great family area upstairs by the open area kitchen. Love that the kids had their own bedrooms and bathrooms downstairs with the bunk beds which didn't impact the adult fun going on upstairs. Great deck with a CLEAN BBQ grill. CLEAN hot tub. CLEAN bedrooms. Two blocks from restaurants and Safeway made my life easy during the week. I would definitely rent this house out again. Perfect Tahoe Perch! Can't wait to go back! One of the best Tahoe spots! We love this house- perfect for our family and friends, esp with kids. Awesome bunk room. 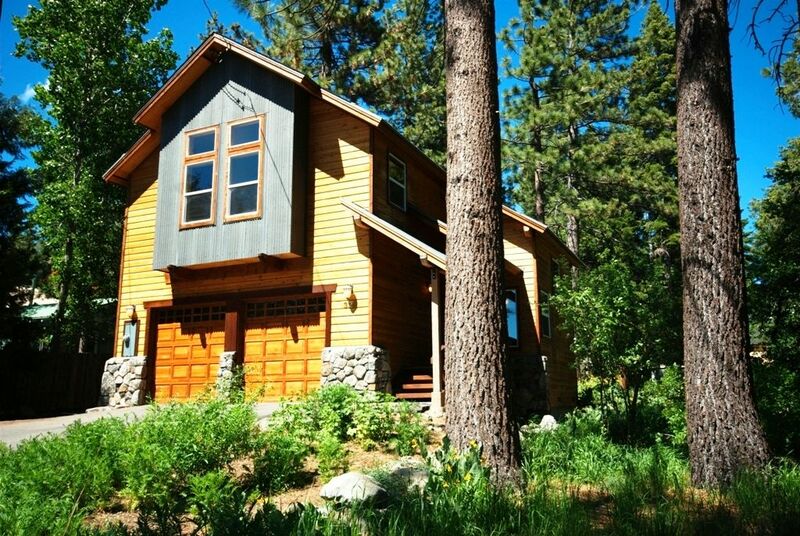 The location is amazing- quick access to Squaw Alpine in winter and just a couple blocks to the lake for summer fun. East walk to Rosie's and everything else in town. The house was spotless, well equipped and spacious....it's a bonus that the owners were extraordinarily responsive and kind. We can't wait to go back! We arrived to this great house and it had all the amenities we could imagine! It has plenty of space and things for kids to play with, a great common area with an open kitchen as well as a large table so everyone could eat together. It even had all the things we needed to cook at home. We also enjoyed walking to restaurants, a movie theater and down to the gorgeous lake. When we skied, it was a short car ride there and back and plenty of space and hooks to store ski gear. Super bonus: A dip in a nice, clean, easy to operate hot tub. While it was snowing, ahhhhhh. Owners even checked in on us a time or two. We loved our time here, loved this house and we can’t wait to go back. We stayed in this house in mid October 2018. Unfortunately, we found this home to be lacking in so many ways. We remain shocked that those before us were so delighted that they gave it perfect reviews. In addition, we feel duped by the owners VRBO description of this home. They use the words "new" and "brand new" 11 times in boasting of this house's amenities. We saw nothing that looked new or remotely new. What we found was a house with furnishings that are cheap, dirty, worn, mismatched, damaged, stained, and in several cases, unusable. The best way to describe it is a dorm filled with dorm furniture. Our disappointment started as soon as we arrived. The entire property has dead weeds waist high with various trash and debris. The front yard had a broken and discarded lawn chair while the back had an old Christmas tree and numerous scattered beer bottles. The large deck was covered with pine needles, pine cones, beer bottle caps, etc. I spent 15 minutes sweeping it. The refrigerator and freezer had at least two dozen items left over from previous renters. We don't use or appreciate having opened, used food and condiments left by strangers. Who does? Additionally, the downstairs shower was unusable because of an earlier uncompleted repair. None of the upstairs windows have window coverings ( At night several neighbors can easily look into this house and disturb your privacy). Fortunately, the bedrooms do have window coverings but one of them in the master bedroom was slit in half and held together by diaper pins! Really classy. The hot tub was unusable for us. It had a combination lock that wouldn't open. Contacting the owner was no help. He acknowledged that he lived far away and that he had no local person or agency to help out. He suggested that we go to the local hardware store and buy bolt cutters. If you rent this house and have problems, as we did, you will be on your own unless you clean it or fix it yourself. On our last day, while still half-dressed and preparing to leave, the housekeeper, silently and without notice, entered the house. We heard her and called out to have her leave. Instead, she continued up the stairs and into the bathroom hall were she shocked and embarrassed us. It may sound funny but it wasn't. When notified of this the owner didn't even apologize. Oh Steve stop ranting with your fake news. Let me first address the two real issues Steve had and correctly frame them so that chicken little doesn't think the sky is falling. 1) Yes the downstairs shower has a shower head on a wand. The holder on the wall for that wand had broken. So if you wanted to shower downstairs you had to hold the wand. Hardly unusable. It was fixed the Monday after he left. 2) Yes, a renter somehow tore one window covering. We pinned it for privacy when we saw it, then ordered a new one and fixed it the next week. The rest of what he wrote was a rant. Let me address the rest of the issues he brought up. After he left I asked my 70 year old school bus driver neighbor (she is rad) if she would mind checking the lock before my next renter showed up. She said two quick tugs of the lock and she opened it. Yes, we don't landscape our yard like 99% of Tahoe, many of those "weeds" are gorgeous flowers at the right time of year. Yes, pine needles fall out of pine trees all the time. Yes, if you don't check out in time you may run into our cleaners. The house was built in 2006, for Tahoe that is pretty darn new. Lastly, I offered one night free to end the saga, he never asked or demanded it. As a matter of fact he said, "I am not trying to get money"" I explained, "OK but this is all I can do at this point so what would be fair to you?" He texted 20 minutes later " how about one night free" So within 5 minutes through vrbo, I sent him $ for a free night. He demanded nothing. Although I am sure that is what he was after all along. Lastly he claimed he couldn't believe I call this a 5 star place. I don't write reviews, that is simply what 26 other renters rated it. Cheer up Steve! The cabin is the perfect amount of space and comfort for two families. We do take a security deposit of $500. I know from years and years of being a renter in Tahoe, the deposit works, we just want you to treat our home like its your own. If you break something please just own up to it. Thank you, I will promptly repay your deposit when housekeeping gives us the "all good"